Food Safety Coaching will gives you basic information on how you can do food safety to your establishment. Food Safety is basically keeping your food away from hazard. Now, what we want to achieve whenever we deal with FOOD SAFETY, we want our food to be safe, in good quality and nutritious. What we offer here as just basic workshop and information that you can use or apply to your HOME or your ESTABLISHMENT. 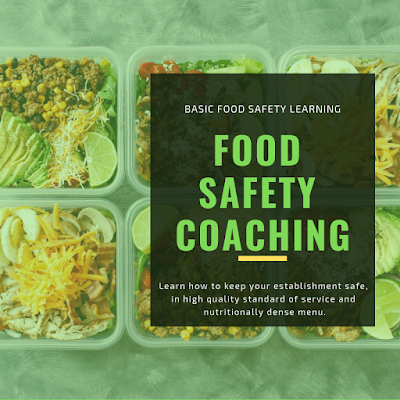 You can also hire me to basically check your operation if you follow a DOH Standard for Food Safety and also to conduct training to your food service worker. I also accept ServSafe Food Safety Manager Training and Certification that can be use if you're planning to go abroad. (Available only in Class within certain number of participants).